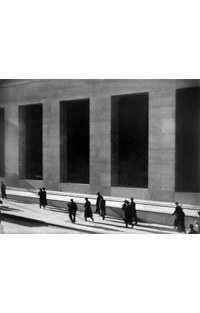 "Paul Strand, Master of Modern Photography" at the Philadelphia Museum of Art, Philadelphia. “Paul Strand, Master of Modern Photography” at the Philadelphia Museum of Art, Philadelphia. The museum commissions the first retrospective in almost 50 years dedicated to one of the great masters of photography. This exhibition explores the remarkable evolution of the work of this American artist, from his beginnings in the 1920s with the examination of the abstract up until his last years in France, in Orgeval near Paris. Constantly motivated by an exacerbated social sense, Paul Strand demonstrates his own investment in humanism and world evolution, such as . The exhibition is also an opportunity to discover more than 3000 images of archives recently that the museum has recently acquired, which also possesses the largest collection of photographic snapshots by Paul Strand. “American Impressionism” at the Thyssen-Bornemisza Museum, Madrid. “Bernardi Roig: NO/Escape” at the Phillips Collection in Washington. “Thailand Street Photos” at the Maison de l’Indochine. “Hubert de Givenchy” at the Thyssen Bornemisza museum, Madrid.